Draft: 2002, Texas Rangers, 42nd rd. attended A.B. Miller HS (Fontana, CA) and Riverside Community College (CA)...was 18-5 in 2 seasons at Riverside, including 11-5 with a 1.93 ERA in 16 G/15 GS as a sophomore...originally signed by Rangers scout Steve Flores. innings and WHIP (1.059)…was a frequently used part of the Rangers bullpen prior to the All-Star break, ranking 3rd in the A.L. in relief innings at the time of the trade on7/19…totaled the 2nd-most relief innings in MLB, trailing only Tampa Bay's Ryan Yarbrough (118.2)…over his final 45 appearances beginning 6/1, compiled a 1.68 ERA (12 ER/64.1 IP) with 61 strikeouts against 11 walks. Opened season with Blue Jays and pitched exclusively out of bullpen for fi rst ti me since 2013...Pitched to a 2.45 ERA (25.2 IP - 7 ER) across first 25 appearances with 28 strikeouts and nine walks...Earned fi rst win of season July 26 vs. San Diego aft er tossing three innings in a 12-inning victory for Toronto...Traded to Dodgers on Aug. 1 in exchange for RHP Mike Bolsinger...With Dodgers, held fi rst batt ers faced to a .190 (4/21) batti ng average...Had 9.1 inning scoreless streak from Aug. 7-22 across parts of seven appearances for Dodgers. Began the season with four relief appearances but then made 26 starts before going on the disabled list Sept. 16 with a fractured rib. • His .318 winning percentage tied for the lowest in the American League and he tied for 2nd in losses…The losses were 2nd most by an A's pitcher over the last 17 years (Greg Smith, 16 in 2008). • Had career highs in games started (26), innings pitched (157.0), losses (15), hits (164), runs (78), earned runs (73) and home runs (18)…Matched his best in strikeouts (136) and saves (1). • Went 3-6 with a 5.59 ERA in 11 starts after the All-Star Break after going 4-9 with a 3.40 ERA in 19 games before the break…Now has a 3.72 career ERA before the break compared to 5.97 after the break. • Allowed a .268 opponents' batting average, including .240 against RH hitters…LH hitters hit .291 with 14 of his 18 home runs and 37 of his 50 extra base hits (.487 slugging percentage)…Righties slugged just .316. • Was 5-6 with a 3.38 ERA in 14 games at home compared to 2-9 with a 4.92 ERA in 16 games on the road. • Was 4-9 with a 3.47 ERA in 15 starts on four days rest compared to 3-6 with a 5.73 ERA in 11 starts on five days rest or more. • Received two runs of support or fewer in 17 of his 26 starts and his season RSA of 3.73 was sixth lowest among AL pitchers with 150 or more innings pitched. Spent most of the season with the A's and was 2-4 with a save and a career-low 3.92 ERA in 35 games over two stints…the save was the first of his career and he also struck out a career-high 55 batters … also had career lows in opponents batting average (.230), on-base percentage (.302) and slugging percentage (.318) … matched his career highs in wild pitches (5) and hit batters (3) … surrendered just three home runs in 57.1 innings, an average of 0.47 per nine innings…entered the season with 34 home runs in 177.1 career innings (1.73 per nine innings)…had a 2.97 ERA and .210 opponents batting average in 18 games before the All-Star Break…then compiled a 5.25 ERA and .258 opponents average in 17 games after the break…his opponents batting average included a .212 (21-for-99) mark against right-handed hitters compared to .246 (29-for-118) against left-handers …yielded all three of his home runs to right-handers but issued 14 of his 20 walks to lefties…allowed a .167 batting average with runners in scoring position and two outs…had a .269 batting average over his first 15 pitches in a game, .193 after that…first batters faced were 8-for-32 (.250) with two walks (.286 on-base percentage) … allowed 8-of-26 (30.8%) inherited runners to score…had a 2.73 ERA and .181 opponents batting average in 20 games on the road compared to a 5.20 ERA and .277 opponents average in 15 games at home…opponents hit .333 with a .418 on-base percentage when leading off an inning…led AL relievers in sacrifice hits allowed (6) and averaged the seventh most pitches per game (27.1)…tied for fifth among all AL pitchers in sacrifice hits…tossed at least one inning in 30 of his 35 appearances, including 10 outings of two or more. stint…had a 6.23 ERA and .350 opponents batting average when he was optioned to Sacramento April 29…returned May 10 and spent the remainder of the season with Oakland…did not allow a run in six of his first seven outings following his return…had a 0.59 ERA and .132 opponents batting average over that stretch that ran from May 10 to June 13…it included a career-high 12.2-inning scoreless streak from May 15 to June 13…capped his scoreless streak by tossing 5.2 scoreless innings of relief June 13 against New York (AL) for his first win in the A's 3-2, 18-inning victory over the Yankees … allowed just one hit and walked a season-high two while striking out a career-high tying seven (also May 27, 2012 at Texas)…it was the longest relief appearance of his career and the longest outing by an A's reliever since Lenny DiNardo tossed 6.0 innings Aug. 2, 2008 against Boston…was charged with his first loss in his next outing June 17 at Texas…allowed two runs to score plus an inherited runner … allowed 3-of-7 (42.9%) inherited runners to score through that game but then allowed just 2-of-14 (14.3%) to score over his next 17 contests…was charged with his second loss of the season when he allowed a season-high four runs in 1.1 innings in a 7-1 loss to St. Louis June 29…tossed 4.0 scoreless innings for his first career save in a 10-4 win at Kansas City July 7…it was the fourth four-inning save by an A's reliever since 1991, the first since Chad Gaudin May 4, 2006 against Cleveland…matched his season high by allowing four hits July 25 against Los Angeles (AL)…yielded three runs in that game and allowed three runs in three of six games from July 25 to Aug. 17 (10 er in 10.2 ip, 8.44 ERA)…matched his season high with two walks July 28 against Los Angeles (AL)…appeared in just six of the A's 38 games from Aug. 2 to Sept. 12 and allowed a run in the four of those contests (4.05 ERA)…struck out in his only at bat of the season Aug. 7 at Cincinnati and is 0 for 5 with five strikeouts in his career…walked a season-high two batters in back-to-back outings Aug. 20 against Seattle and Aug. 23 at Baltimore…did not allow an earned run over his final six outings beginning Sept. 15 (6.1 ip, 2 h, 1 r, 1 bb, 8 so)…was on the A's roster for the ALDS against Detroit but did not appear in a game. SACRAMENTO: Was used exclusively as a starter with Sacramento and went 2-2 with a 2.70 ERA in five starts…allowed just one home run in 30.0 innings…walked five batters, an average of 1.50 per nine innings…struck out 26 for a strikeout to walk ratio of 5.20…yielded a .285 opponents batting average, including .240 (18-for-75) against right-handed hitters compared to .354 (17-for-48) against left-handers…went 1-1 with a 2.45 ERA in three starts before he was called up by Oakland the first time April 20…that included a season-high nine strikeout game for his first win, April 15 at Reno … logged a 1-1 record and a 3.09 ERA in two starts during his second stay with the River Cats from April 29 to May 9. Was acquired from the Toronto Blue Jays Aug. 24 for cash considerations and was sent to Sacramento before he was recalled by the A's Sept. 10...allowed seven runs in 3.1 innings in four relief appearances with Oakland for an 18.90 ERA and .474 opponents batting average...was also 1-1 with an 8.44 ERA and .281 opponents average in nine games, two starts, with Toronto...combined for a 9.85 ERA in 13 appearances overall...surrendered seven home runs in 24.2 innings for a .593 opponents slugging percentage...struck out 30, an average of 10.95 per nine innings...allowed a .315 opponents batting average, including .279 (19-for-68) against right-handed hitters compared to .375 (15-for-40) against left-handers...opponents hit .197 with the bases empty, .500 with six of his seven home runs with runners on base...including .519 with runners in scoring position...has allowed a .335 (68-for-203) average with RISP in his career...allowed 7-of-8 (87.5%) inherited runners to score, including all three with the A's...first batters faced were 4-for-10 (.400) with a walk in his 11 relief appearances...was 0-1 with a 10.38 ERA in his two starting assignments, 1-0 with a 9.56 ERA in 11 relief appearances...opponents were 5-for-24 (.208) with one walk (.240 on-base percentage) leading off an inning...has allowed a .190 (29-for-153) batting average to hitters leading off an inning in his career...allowed a .360 batting average the first time through the lineup, .212 after that. Appeared in four games at the Major League level with Kansas City, allowing runs in three of his four outings... CLOSE IT OUT: Spent most of the season at Omaha (AAA) serving at the team's closer... Saved 16 games in 21 opportunities... BIG SUMMER: Over the months of June and July saw his best success, recording a eight saves and 0.92 ERA (19.2IP/2ER)... From May 31-Aug. 10, allowed runs in only 2 of 21 outings... Did not blow a save until his 15th outing of the season... Did not allow a run in his first nine outings at Omaha, totalling 13.2 innings... WINTER BALL: Played in the Mexican Winter League, posting a 0-1 record with a 3.38 ERA and one save in 17 relief appearances. Jesse was acquired from the Atlanta Braves on July 31 with Gregor Blanco and minor league hurler Tim Collinsin exchange for OF Rick Ankiel, RHP Kyle Farnsworth and cash considerations....Finished strong for the Royals, posting a 1.74 ERA (10.1 IP, 2 ER) over his final 9 relief appearances, holdingbatters to a .167 average over that span. Spent first full season in the Majors and led the Pittsburgh pitching staff with 73 appearances...Led all Major League rookies in appearances...Made seven straight scoreless appearances from 5/14-25 (7.0 IP)...Led pitching staff with 16 appearances during the month of May...Earned first Major League plate appearance (K) on 8/18 vs. Milwaukee...Picked up first Major League win on 9/6 vs. St. Louis...Pitched 2.0 scoreless frames on 9/25 vs. Los Angeles and finished season making four straight scorelessappearances (4.2 IP). Spent majority of season with Triple-A Indianapolis and was named the club's Pitcher-of-the-Year... Established career high in appearances and converted his team-high 14 saves in 19 opportunities... Ranked ninth in the International League in saves... Held right-handed hitters to a .177 (25-for-141) batting average and two home runs while left-handed batters hit .282 (33-for-117) with six home runs... Was scored upon just twice in his first 11 games with Indy and had a 1.40 ERA (19.1IP/3ER)... Struck out at least one batter in 15 consecutive games from June 25 thru Aug. 6 (26K in 19.2IP)... Was selected by Pittsburgh on Aug. 27 and made Major League debut that afternoon vs. Chicago (NL) at PNC Park and retired each of the three batters he faced... Was scored upon in four straight games (4.1IP/5ER) with Bucs after his first outing... Surrendered walk-off grand slam to Ryan Braun and suffreed first big league loss on Sept. 25 at Milwaukee... Ended season with back-to-back scoreless outings...Was scored upon just three times, and struck out 11 batters, in his last 10 games (9.2IP)...Went 0-for-2 in save situations with the Pirates and allowed three of his five inherited runners to score... Held left-handed batters to a .217 average (5-for-23) while right-handed batters hit .395 (15-for-38)...Participated in the Dominican Winter League and went 2-1 with a 5.54 ERA (13.0IP/8ER) in 13 appearances with Gigantes del Cibao. Spent first full season with Indianapolis... Ranked second on team in appearances... Made 45 of his 46 appearances in relief... Was scored upon in five of first six appearances... Was scored upon once in eight appearances (16.2IP/2ER) from April 28-May 19... Surrendered just one home run in final 29 appearances (52.0IP)... Went 1-2 with four saves and a 6.00 ERA (12.0IP/8ER) in 11 appearances for the Phoenix Desert Dogs during the Arizona Fall League. Went 4-6 with four saves and a 4.38 ERA in 51 appearances with three different minor league teams... Began season with Frisco (Rangers' AA)... Tossed 2.0 hitless frames and earned first save on April 19 vs. San Antonio... Lost each of his first four decisions from Apr. 13 through May 21... Was scored upon just once in a six-game stretch from May 24 thru June 7 (10.0IP/1ER)... Was promoted to Triple-A on July 28 and made lone appearance with Oklahoma on July 29...Was acquired by Pittsburgh organization on July 31 and assigned to Indianapolis... Participated in the Arizona Fall League and went 3-0 with four saves and a 0.64 ERA (14.0IP/1ER) in 12 relief appearances with Grand Canyon... Was named to Arizona Fall League's All-Prospect Team for his efforts. Split season between Bakersfield (Rangers' A) and Frisco and went 4-3 with a 4.65 ERA in 42 relief appearances... Held opponents to a .182 (16-for-88) average while pitching with Bakersfield... Made four straight scoreless outings to begin the season (10.2IP)... Earned his two saves on April 23 vs. Inland Empire and May 13 vs. Visalia...Gave up three runs in final appearance with Bakersfield on May 20 at Stockton, raising ERA from 1.29 to 2.22... Was promoted to Frisco on May 23 and made Double-A debut on May 25 at Arkansas, where he allowed one run in 2.2IP...Picked up first win on June 27 vs. Tulsa...Earned victories in back-to-back outings on June 27 and June 30 and again on Aug. 5 and Aug. 7...Recorded a 0.71 ERA (12.2IP/1ER) in final five appearances and was not charged with an earned run in his last 8.1 innings... Allowed three grand slams, the most by any pitcher in the Texas League. Spent entire season with Clinton (Rangers' A), his last year used primarily as a starter... Ranked second on staff in starts and third in innings pitched and strikeouts... Tossed 4.0 innings of scoreless relief and picked up win in first appearance on Apr. 8 at Wisconsin... Went 2-0 with a 3.94 ERA (16.0IP/7ER) in his first relief outings... Won three straight decisions from Apr. 17 thru May 6... Suffered five straight losses from July 11 through Aug. 6. Spent first professional season with Spokane, Texas' entry in the Northwest League... Recorded victories on July 6 vs. Yakima and July 27 vs. Eugene... Earned lone save on Aug. 26 at Boise. 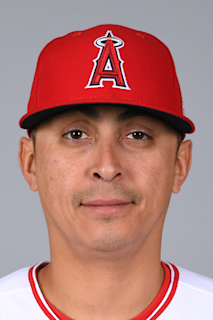 November 30, 2018 Texas Rangers signed free agent RHP Jesse Chavez. October 29, 2018 RHP Jesse Chavez elected free agency. July 21, 2018 Chicago Cubs activated RHP Jesse Chavez. July 19, 2018 Texas Rangers traded RHP Jesse Chavez to Chicago Cubs for LHP Tyler Thomas. February 23, 2018 Texas Rangers signed free agent RHP Jesse Chavez. November 2, 2017 RHP Jesse Chavez elected free agency. November 14, 2016 Los Angeles Angels signed free agent RHP Jesse Chavez. November 3, 2016 RHP Jesse Chavez elected free agency. October 23, 2016 Los Angeles Dodgers activated RHP Jesse Chavez. October 7, 2016 Los Angeles Dodgers reassigned RHP Jesse Chavez to the minor leagues. August 2, 2016 Los Angeles Dodgers activated RHP Jesse Chavez. August 1, 2016 Toronto Blue Jays traded RHP Jesse Chavez and cash to Los Angeles Dodgers for RHP Mike Bolsinger. May 24, 2016 Toronto Blue Jays activated RHP Jesse Chavez. May 18, 2016 RHP Jesse Chavez roster status changed by Toronto Blue Jays. November 20, 2015 Oakland Athletics traded RHP Jesse Chavez to Toronto Blue Jays for RHP Liam Hendriks. November 3, 2015 Oakland Athletics activated RHP Jesse Chavez from the 60-day disabled list. September 16, 2015 Oakland Athletics placed RHP Jesse Chavez on the 60-day disabled list. Fractured rib. October 2, 2014 Oakland Athletics activated RHP Jesse Chavez. September 30, 2014 Oakland Athletics reassigned RHP Jesse Chavez to the minor leagues. May 10, 2013 Oakland Athletics recalled RHP Jesse Chavez from Sacramento River Cats. April 29, 2013 Oakland Athletics optioned Jesse Chavez to Sacramento River Cats. April 20, 2013 Oakland Athletics recalled Jesse Chavez from Sacramento River Cats. March 10, 2013 Oakland Athletics optioned Jesse Chavez to Sacramento River Cats. October 12, 2012 Jesse Chavez roster status changed by Oakland Athletics. September 10, 2012 Oakland Athletics recalled Jesse Chavez from Sacramento River Cats. August 26, 2012 Oakland Athletics optioned Jesse Chavez to Sacramento River Cats. August 24, 2012 Toronto Blue Jays traded RHP Jesse Chavez to Oakland Athletics for cash. August 6, 2012 Toronto Blue Jays optioned RHP Jesse Chavez to Las Vegas 51s. August 5, 2012 Toronto Blue Jays designated Jesse Chavez for assignment. August 4, 2012 Toronto Blue Jays recalled Jesse Chavez from Las Vegas 51s. July 30, 2012 Jesse Chavez roster status changed by Las Vegas 51s. July 21, 2012 Las Vegas 51s placed RHP Jesse Chavez on the 7-day disabled list. July 15, 2012 Toronto Blue Jays optioned RHP Jesse Chavez to Las Vegas 51s. June 19, 2012 Toronto Blue Jays recalled Jesse Chavez from Las Vegas 51s. June 6, 2012 Toronto Blue Jays optioned Jesse Chavez to Las Vegas 51s. May 27, 2012 Toronto Blue Jays selected the contract of Jesse Chavez from Las Vegas 51s. December 14, 2011 Toronto Blue Jays sent Jesse Chavez outright to Las Vegas 51s. December 12, 2011 Toronto Blue Jays designated Jesse Chavez for assignment. October 21, 2011 Toronto Blue Jays claimed Jesse Chavez off waivers from Kansas City Royals. October 18, 2011 RHP Jesse Chavez assigned to Tomateros de Culiacan. October 11, 2011 Kansas City Royals designated Jesse Chavez for assignment. September 1, 2011 Kansas City Royals recalled RHP Jesse Chavez from Omaha Storm Chasers. June 7, 2011 Kansas City Royals optioned Jesse Chavez to Omaha Storm Chasers. June 3, 2011 Kansas City Royals recalled Jesse Chavez from Omaha Storm Chasers. March 17, 2011 Kansas City Royals optioned Jesse Chavez to Omaha Storm Chasers. June 16, 2010 Atlanta Braves recalled Jesse Chavez from Gwinnett Braves. June 15, 2010 Atlanta Braves optioned Jesse Chavez to Gwinnett Braves. December 11, 2009 Atlanta Braves traded RHP Rafael Soriano to Tampa Bay Rays for RHP Jesse Chavez. November 3, 2009 Pittsburgh Pirates traded RHP Jesse Chavez to Tampa Bay Rays.